Your store's payment methods can be managed using the Payment methods page of your store's Admin area (Settings menu -> Payment methods). Please note that manual processing of credit cards is not supported by X-Cart versions 4.5.0 and later due to PCI DSS requirements; thus, the Credit Card payment method requiring manual processing of credit card data is no longer included. You can enable/disable any of the payment methods listed in the Payment methods section: simply select the check boxes for the payment methods you want to use and clear the check boxes for the payment methods you want to disable. Be sure to click Apply after you make any changes. Methods: The payment method name as it appears to your customers. If you are not happy with the name of any method, you can change it. Also, if your store supports more than one language, you can use the multilanguage feature to translate the names of payment methods for your international customers. To add a translation, select the desired language from the Language selector, enter the translation into the 'Methods' field and click Apply (repeat for each language). Extra charge: Some payment methods may require an additional processing charge. Thus, the 'Extra charge' field shows the amount that customers using a specific payment method are charged as processing fee. The 'Extra charge' value can be defined as a percentage of the amount due in payment for the goods or as a flat value expressed in currency units. Cash on delivery: Whether the payment method is of the type in which payment for goods is made at the time of delivery. Special instructions (optional): Instructions for customers using specific payment methods. These can also be translated into multiple languages. To add a translation, select the desired language from the Language selector, enter the translation into the 'Special instructions' field and click Apply. Protocol: The protocol (HTTP or HTTPS) used to transfer the customer's payment information. HTTPS should be used for any methods in which sensitive data will be entered on your website and transferred over the Internet. If you enable the HTTPS protocol for any method, make sure you have a valid SSL certificate installed and configured on your web server and the variable $https_location in config.php is defined properly. For details please refer to: Configuring HTTPS. Membership: The user membership level(s) to which the payment method is available. Hold down the Ctrl key to select multiple levels. Select All to make a payment method available to all users. Pos. : The number defining the position of the payment method; this affects the order in which payment methods are displayed to your customers. The payment method selected from this box will be forced on your customers when no other offline or online payment method is available for any reason. To disable this feature, leave the box empty. An overview of payment gateways supported by the latest X-Cart version is available here: X-Cart:Payment gateways. Note that since version 4.5.0 X-Cart no longer supports any background/on-site/merchant hosted credit card payment methods as they had to be removed for PCI DSS compliance. As a result, some payment methods providing online payment processing which used to be available in earlier X-Cart versions can now be used with X-Cart only via X-Payments, a PA-DSS certified solution. In X-Cart's Payment gateways section, such methods are grouped under the Supported via X-Payments for PCI DSS compliance section title. Note: When X-Payments Connector module is enabled in your store, the section Supported via X-Payments for PCI DSS compliance is not displayed in the Payment gateways list. You will see payment methods available via X-Payments in the Payment gateways list only if they have been imported from X-Payments; payment methods imported from X-Payments appear under the X-Payments payment methods section title. After being added to the list of payment methods, each payment method requiring online processing needs to be configured and enabled. To configure a payment method providing online payment processing, you need to adjust the standard payment method configuration fields (Protocol, Membership, etc) and to provide the information needed by X-Cart software to use the required payment processing API. The said information can be provided on the configuration page of the respective payment processor (This page can be accessed using the Configure link next to the name of the payment processor in the Payment methods section). Please note that some payment gateways (like Authorize.Net, 2Checkout, PayPal, etc) can be set up to work in test or in live mode. Live mode is the mode in which a payment gateway normally works. In live mode, all payment transactions are real, and money actually changes hands. Test mode is provided for the purpose of testing. 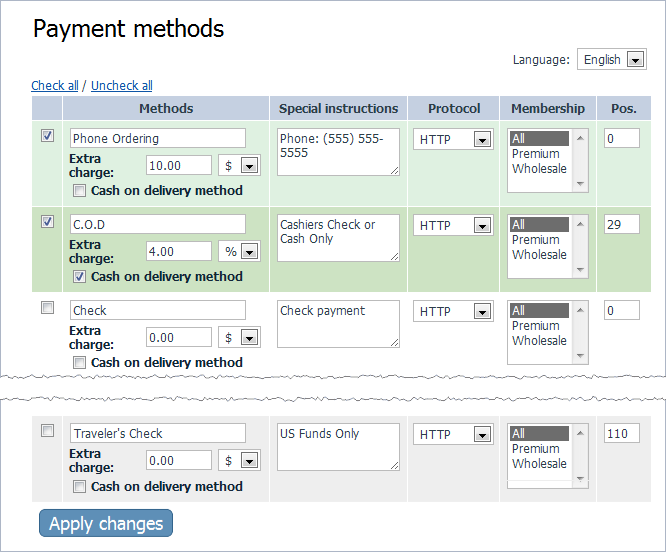 In test mode, payment gateways work the same way as in live mode, with the exception that no actual payments are made. The mode of operation of a payment processor (test or live) can be selected, where available, on the payment processor's configuration page. Information on configuring the most popular payment methods used with X-Cart is available is the Most Popular Payment Methods Supported by X-Cart section of this manual. Payment methods providing online processing are enabled in exactly the same way as methods using manual processing: in the Payment methods section you select the check box to the left of the name of the payment method that needs to be enabled and click Apply. Note: If you use any online payment methods, make sure you do not close access to the <xcart_root>/payment directory by your .htaccess file. If access to this directory is closed, the payment gateway external server sending a callback to X-Cart will get the "access denied" response. As a result, the order will not be processed. This page was last edited on 14 December 2015, at 16:28.